TIP Skills — Nina Barlevy, Psy.D. Today’s Skill of the Month is especially useful to quickly move from extreme emotion into one of more balance. In DBT, we say moving from Emotion Mind to Wise Mind. This set of skills is actually part of the Distress Tolerance module in DBT and first made an appearance in Marsha Linehan’s 2015 update to her original skills manual. Let’s take a look! This is a series of four skills or techniques that together can be remembered with the acronym TIP. They each help to change the emotional state through very physical or behavioral means because as you may have noticed if you’ve ever been in a state of heightened emotion, bringing in the cognitive skill (thinking) is extremely hard to do if not impossible. The first suggestion is to change the Temperature of the face with cold water. This will help calm down the emotionality quickly. As strange as it may seem, we want to actually make our brains think that we’re diving underwater because this physiologically causes the heart rate to decrease as well as directing the blood flow away from the extremities and nonessential organs, instead sending the blood to the heart and brain. So, to do this, you don’t have to literally dive into a large body of water! We can simulate this by doing the following procedure. First, hold your breath and put your face in a bowl of cold water. 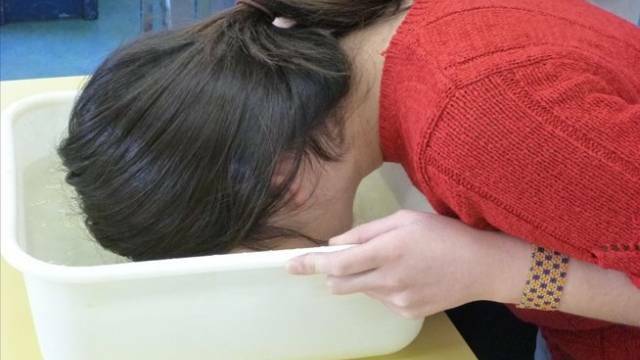 If you don’t have a bowl available, fill a ziplock bag with cold water and hold it on your eyes and cheeks while holding your breath. It is important to remember that this “dive response” may take 15 to 30 seconds to start, so hold your face in the cold water for about 30 seconds. The water should not be less than about 50 degrees—the temperature that the water coming out of your kitchen or bathroom faucet when only the cold water is turned on is just about right. There may also be some "shock" factor which helps to rapidly shift the focus away from what has caused the emotional state since you're now face down in cold water! This is similar to the movie-classic of throwing a glass of water on someone that is upsetting you--you're kind of doing that to yourself! Doing this in the bathroom is a good idea. I have often reminded clients that the bathroom is usually one of the only rooms in a house that it is perfectly acceptable to go into by oneself, lock the door, and be alone for several minutes. Additionally, this strategy may work best when you are not being distracted by noise or activity. Sitting quietly during the technique will usually yield the best results. I recommend storing a large plastic bowl or other container that accommodates your face in the bathroom under the sink so that when you need it you don’t have to go hunting for something to use. If this is not possible, at least have a large gallon-size ziplock bag stored in the bathroom in order to make a cold pack as described above. Fill it up, sit down and calmly put your face in the water. This technique will often be big help to literally cool you down from extreme emotions and can be particularly useful for helping to prevent acting on urges to engage in dangerous behaviors—whether self-harm behaviors or violence towards others. The next technique in this series is Intense exercise. Engaging in intense exercise, if only for a few minutes can expend some of your body’s stored energy thereby reducing the jittery feeling that frequently accompanies intense emotions. As with most skills, it is important to do some preparation. BEFORE you need to use this technique, think about what you can do—run, walking fast (where would you go? do you need things with you if you do this?) jumping, playing basketball, lifting weights… what are things that you can do in your area that are easily accessible? Have ideas in mind beforehand so that if you need to go, you can go without much prep—remember, in the moment, our thinking brains aren’t functioning too well so do the thinking ahead of time! The first of the two P skills is Paced breathing. As I have mentioned before, when we become aware or focus on our breathing, it naturally slows down but this is an active attempt to do some abdominal breathing or at least visualize the breath deep in your body. Really make an effort to slow the pace of your breathing so that you’re only breathing 3-5 cycles in a minute (inhalation, holding the breath, and exhalation being one cycle). I do recommend, if it is possible, to really make an effort to do abdominal breathing as described previously. Counting during inhalation and exhalation helps tremendously to focus your mind on the breath and away from the distressing situation. Finally, the last part of P is Paired muscle relaxation. I have described this technique previously as well. Refer to it for full details, but in a nut-shell, while you’re breathing deep into your body, you tense your muscles for 15 or so seconds, noticing the tension in the muscles. While breathing out, say the word “relax” (or another word of your choosing) in your mind or aloud while you let go of the tension you’re holding. I like to pretend I’ve become a rag doll, letting all of the muscles go slack. Notice the difference in your body between the tension and the relaxation. I hope you will give each of these techniques a try and use them in tandem with each other if needed. They will all help you to TIP the scales and get you back into emotional balance. You may be surprised at how effective even one of these may be when you’re in a highly emotional state!